I love a good donut, especially a homemade one. What I don’t love is the pain associated with deep frying them. It is messy, time consuming and certainly more fattening. 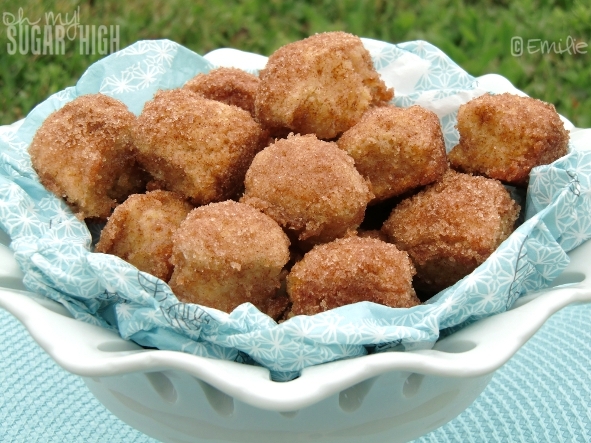 These baked Cinnamon Breakfast Bites mimic what I love about donut holes but without all the added stress and calories. They are super scrumptious and I encourage you to try them out yourself and see how long they last in your house! 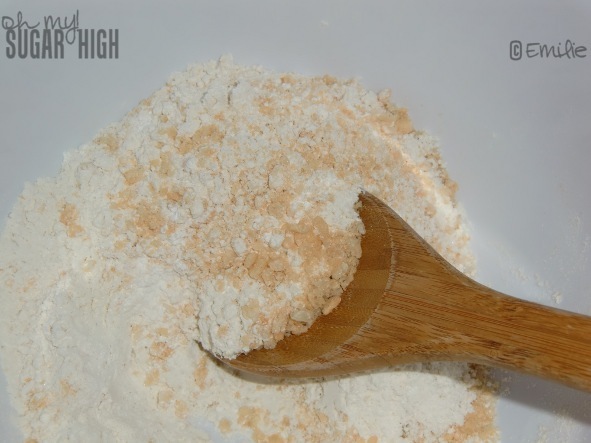 Mix flour, crushed cereal, 2 tablespoons sugar, baking powder and salt in large bowl. 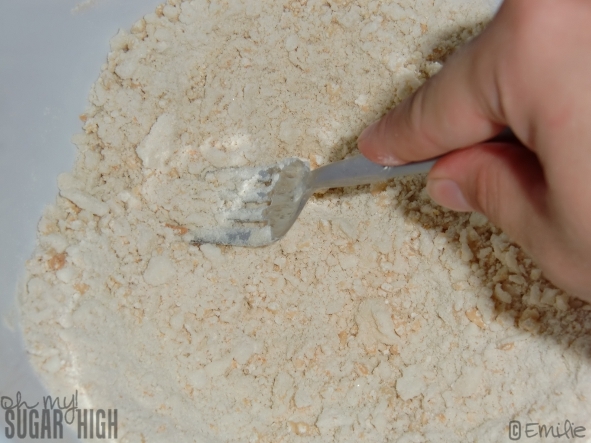 Cut in shortening with pastry blender or fork until the mixture resembles coarse crumbs. 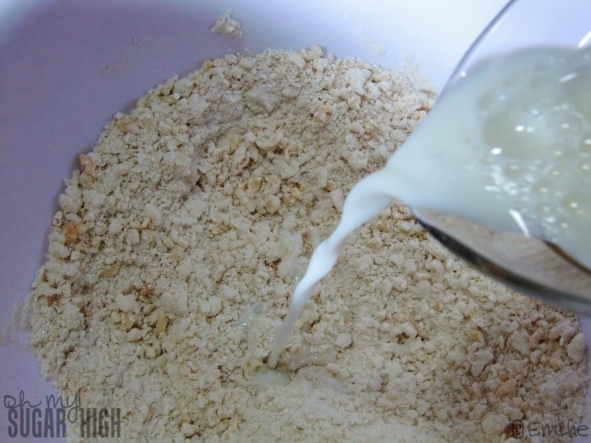 Add milk and stir just until moistened. 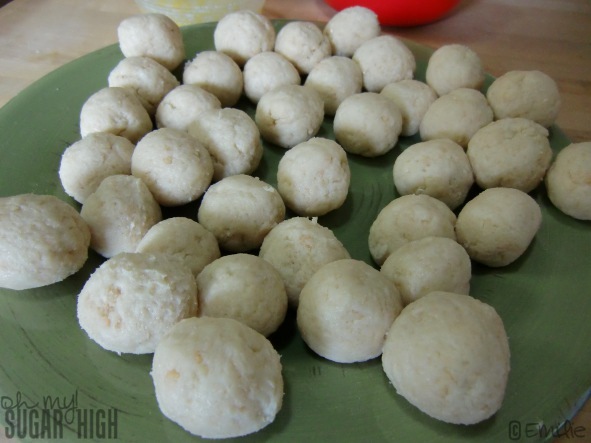 Roll dough into approximately 2 1/2 dozen 1 inch balls. Mix cinnamon and remaining sugar in a small bowl. 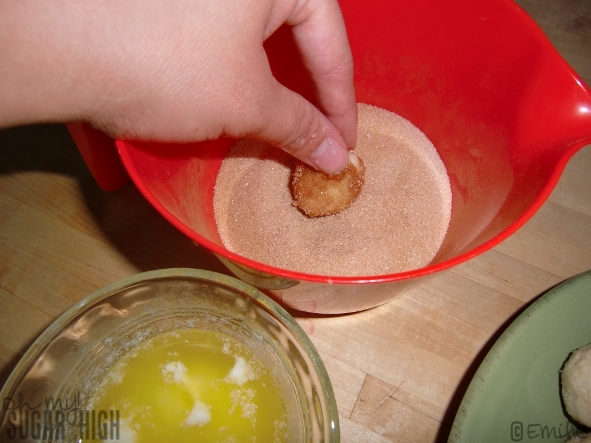 Drop balls into melted butter and roll in cinnamon sugar mixture. Place balls onto greased 8 or 9 inch round pan. Bake at 425 degrees for 15-18 minutes or until inserted toothpick comes out clean. Cool for a few minutes in pan on wire rack before removing. If you are looking for a perfectly rounded ball, try using a cookie sheet or jelly roll pan as mine baked together. They weren’t exactly round but they still turned out beautiful! This recipe is courtesy of the 2001 Taste of Home Annual Cookbook and available on Taste of Home. It was submitted by Ruth Hastings. Those look YUMMY, thanks for the recipe! Oh, those look good! I’ll have to try them–I have lots of Rice Krispies at home! omg my mouth is watering. my gram used to do something like this. she’d deep fry them (only around the holidays b/c it is a pain) and we’d call them fritters then roll them in confectioners sugar. I can’t wait to try this. So I made them sooner than I thought- I just put mine in the oven. I can’t wait to try them!! That is awesome! What did you think of them??? They were really good- There are only 3 or 4 left. My kids were calling them Tim-bits and if I didn’t put them away they probably would’ve finished them all. Tim Bits? That is so cute. Did they think with cinnamon you were saying Tim? So glad you enjoyed them! 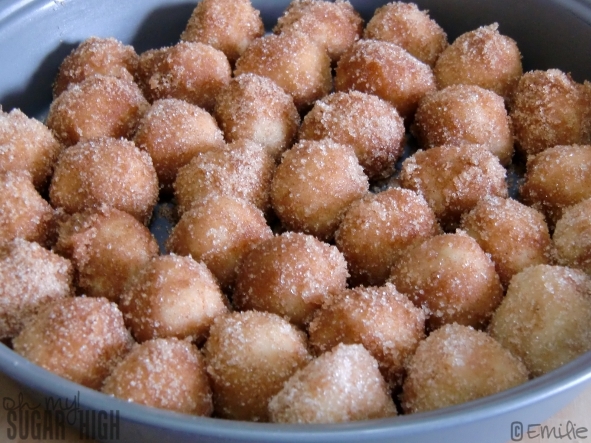 Tim-bits are donut holes from Tim Hortons, a popular coffee/donut place in Canada and the northern US. Mmmm those look tasty. I love Taste of Home too. My late grandmother always had that magazine. I wish I had her old ones. If you are a current subscriber you can access so many recipes online. My mom has been a subscriber since the beginning so she has a ton of old magazines and bought me this cookbook back in 2001. There are a ton of great recipes in there! I love that they include pictures of everything! YUMMO! Those looks so good! Growing up we made these using refrigerated biscuit dough. Just rolled them into balls and dipped in butter and the cinnamon sugar mixture. I bet the homemade dough is MUCH better and looked so easy! I am trying these stat! this is exactly the kind of thing i love. thanks for the recipe! 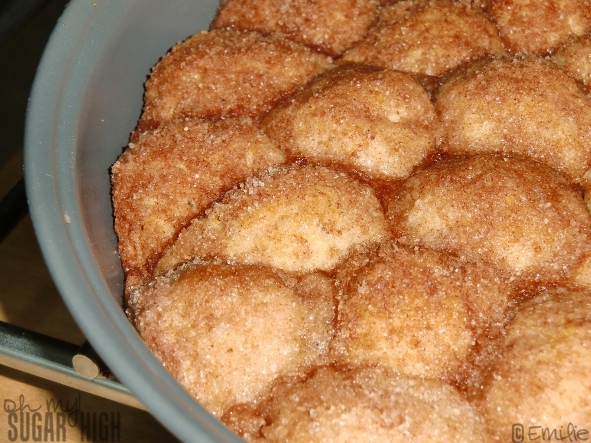 We call this “monkey bread.” I remember making it with my family in a dutch oven while we were out camping, except instead of the recipe you supplied here, we used packaged biscuit dough. Delicious nonetheless. I knew this looked and sounded familiar. This is always my big hit for lockins, or lazy saturday mornings, plus little ones like to help. Using biscuits is the way to go! These look delicious! Reminds me of the monkey bread that my family always makes (and fights over)! i found you on stumble! Wow, these do look scrumptious. The smell in my kitchen alone is my reason for not making real doughnuts. What a great alternative. Yum! I can smell the cinnamon already. These look WONDERFUL. I am going to have to try to make some too! Thanks for posting. just made these the second time and they are even better!! Help! The recipe calls for “2 tablespoons plus 1/2 cup sugar, divided”. Does the 1/2 cup go in the flour mixture or is it mixed with the cinnamon for rolling the dough in? ohhh i have made these twice now and they are so yummy – they are better a little stale (not fresh out of oven)…. thanks for the recipe! Mine turned out really dry… almost like a scone. What did I do wrong?? Did I Overcook them?? HELP! I want these to be good!! Ohhh cinnamon my favorite! I’ve got to try these. They look so easy! This sounds so Yummy. I think I will make them in the morning. Any idea if you can sub regular old butter for the shortening? I have enverything here except shortening. These look amazing!!! Do you think you could make the dough the night before, put them in the fridge, then wake up and bake? just made these this morning for my son and his friends who stayed overnight. scarfed up in seconds! these are fun to make and oh so good right out of the oven! Wow…..found you through Pinterest, just looking at your site is making me gain weight!!! Attempting this recipe tonight! Do you need to use Butter Flavored shortening or can I use the Regular? OMG these are AMAZING! Thanks so much for posting! Wow, these look absolutely delicious! Thanks for the idea…and the Sugar Rush! 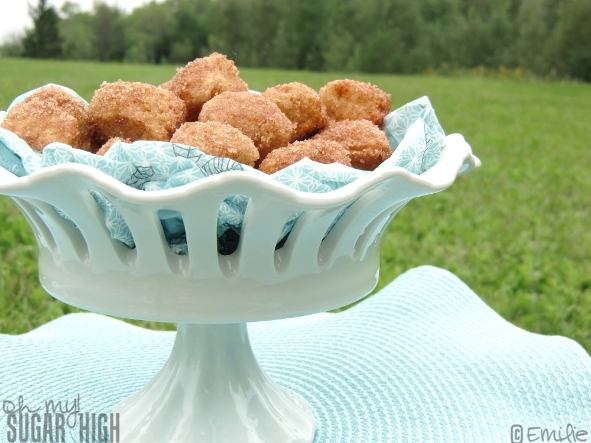 Baked donut holes…I may have reached heaven! Love that cinnamon sugar coating! I made these this morning! I put them in mini-muffin tins for bite-size yumminess and put a little chunk of fresh apple in there! Thanks very much, was delish! I was so excited to try these I made an extra batch. But I must have done something wrong because they tasted terrible…… I followed directions to a T except that the shortening I used was crisco, not butter flavored. Maybe that’s where I went wrong? I’ll be making these again with correct shortening. Where on earth did you get that beautiful dessert stand? I love it and sooo want it for my collection. Also the dessert looks amazing. I was wondering if you could tell me where you got your beautiful white serving dish? I love it! I got it at TJ Maxx for less than $10 for sure! They had a lot of these kinds of dishes there and they are gorgeous! You’ll find most have a removable colored ribbon. 🙂 Actually I think the colored napkins and the place mat came from there too. I love looking there for unique kitchen finds! These were delicious on this rainy morning, but I did change a few things to suit our lifestyle. I don’t use shortening, so I substituted butter. I knew it would change the consistency, and they did come out a bit scone-like. I also have a toddler and not much time, so I pulsed my food processor to cut in the cold butter. I’m sure that over-processed the crisped rice cereal, but it brought everything together in one dish. And the cereal gave the finished product a nice crunch over a biscuit texture. Thanks for the great idea! Do you think that you could freeze the dough to thaw and bake as needed if you made a large batch? I know that doesn’t work for everything, but that would make these SO convenient!